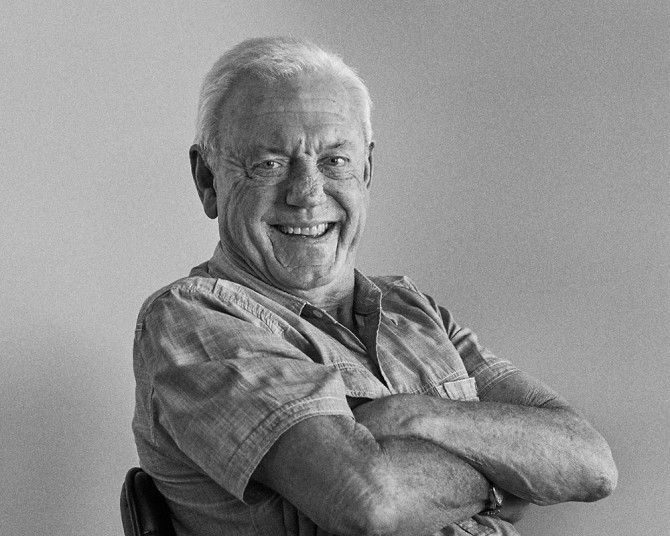 John Bird or Birdy as he’s commonly known, has completed 56 vintages with Penfolds. He’s a real link with the original ‘Schubert and Penfold-Hyland ‘styles. I first met John in the mid to late 90’s, then again in 2012 while working on the Grange book. I wanted to interview him for the DVD, for some reason it did not eventuate. When I thought about my blog ‘People of Wine : Ten Questions’. Birdy was the first person I wanted to interview. He’s still advising Penfolds each vintage. He’s a bit like a living link to the past. Here’s his story. After 56 vintages at Penfolds, some of those while semi-retired, I’m still very interested in winemaking. I am officially on the Penfolds’ books as an educator and wine adviser and I’m really happy still being involved in the winemaking process. I get asked all sorts of questions, mostly I have the answers. In a way I think they like me involved to continue the traditional ‘Penfolds way’. I suppose I am the link to the original Schubert and Penfold-Hyland ‘styles’. How did you to get an interest in wine ? 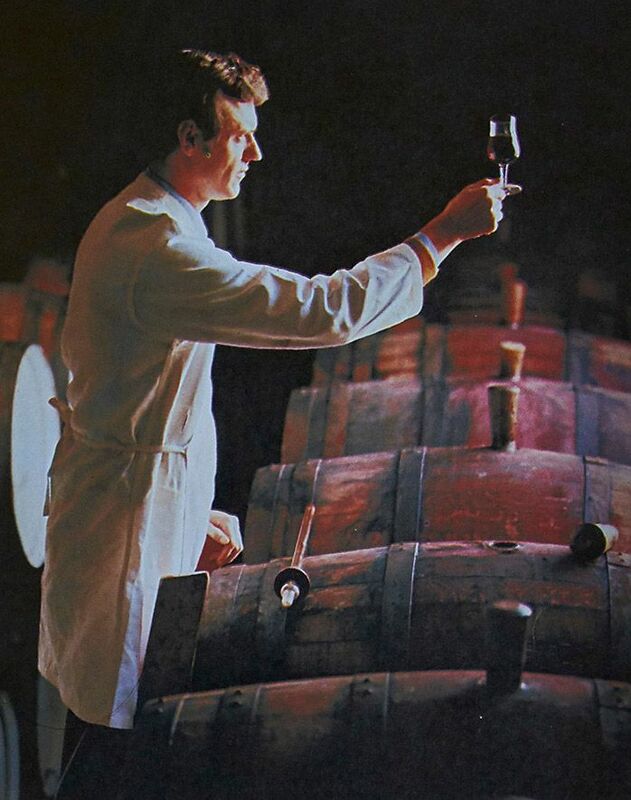 John Bird in his days as Penfolds Senior Red Winemaker at Magill Cellars : Photo Supplied by Penfolds. In 1960 my father heard that Penfolds wanted to put on a young fellow to help them out in the Magill laboratory as a junior lab technician. This appealed to me, so I applied. I was 16. Senior winemaker Murray Marchant interviewed me and offered me the position at a starting wage of five pounds a week. I learnt everything on the job, although there was some study. The Penfold-Hyland family, Max Schubert and all the bosses believed in on-the-job training. It took quite a while for me to get a real interest in drinking wine. Even though I was mixing with some of the best winemakers in the business, I wasn’t into drinking it, after all I did not turn 21 till 1964. In 1967 after I became an assistant winemaker at Magill I really did need to get more involved in tasting and drinking wine. The passion really accelerated in 1970 when I was appointed the Senior Winemaker at Magill. In 1980 I was acknowledged as Penfolds Senior Red Winemaker. By then Penfolds needed the winemakers to specialise in specific wine types – previously winemakers made all types and styles of wine. I was very fortunate, overall it was very good. I was born in 1943 in St Peters, an Adelaide suburb not far from Magill. Dad was a fitter and turner and later ran a trucking business, mum did domestic duties as women did in those days. I was the oldest of five kids. Education was all local on the eastern side of Adelaide. In 1955 on a primary school excursion, our bus passed by Penfolds Winery. I liked what I saw that day and never forgot it. My father occasionally drank wine and cooked with it. Apart from that and what I had seen in the movies, I knew little about wine. I left school in 1959, I was 16 and worked for only three weeks in a local Magill carpentry and joinery shop. I quickly found out that was not for me and thus I joined Penfolds. We lived in Trinity Gardens at the time, about ten muniutes from Magill. My wife Carol and I were married in 1967. We have two children, Sharon born 1969 and Paul in 1971. Both have worked at Penfolds at one time or another. Indeed, so did my wife for a short while. Blending the 2012 Grange. L – R John Bird, Steve Lienert, Andrew Balwin and Peter Gago : Photo Milton Wordley. You have been with Penfolds for almost all Grange vintages. How has that been ? Challenging at times and hard, but rewarding. The winemaking methodology has not changed much over the years, perhaps the fruit is picked a bit riper now, maybe the winemaking process is a little more refined but nothing major. Volatile Acidity ‘VA’ has been mentioned a lot over the years in regard to the early Granges. Some is produced naturally during fermentation. During the early 1960s Max Schubert and Murray Marchant had me testing all the early Granges for VA. Around 1974 we settled on a maximum of just under one gram per litre. To the best of my knowledge it has not exceeded that since. Ray Beckwith said to me once, “Max likes a bit of VA in all his wines, not only Grange”. Do you have any Max Schubert stories? It was a few weeks after I started as a lab assistant that I met Max Schubert, who was ‘National Production Manager’ at the time. Max was definitely the boss. I remember once many years later, the senior staff all got together for a budget meeting. Max chaired the meeting of course, he went around the table asking each person what they wanted in the coming budget. When he got to me the conversation went like this..
“Now Mr Bird, I see you are after four stainless steel tanks for the cold room cellar.” I replied,” that’s right, I want stainless steel tanks to replace the old jarrah vats for efficiency and ease of operation.” The meetings were very formal and Max replied, “well Mr Hyland and I have been talking about this and you can have two.” When I replied I really need four for it to work properly and Max said I could only have two, I replied “I don’t want any then!” “Right” he said and immediately put a line right through my request. That was that, no tanks for me. That’s how it was then, a bit like the army. Classy medium to full bodied reds, fino sherry, tawny ports and high class riesling from either Clare or Eden Valleys. The original early 1970s Penfolds Autumn Riesling was like a trial wine for the modern equivalent of Penfolds Yattarna. I also like any good French chablis style. I’ve always thought the French make the best whites, but we are getting very close with many of the recent Australian chardonnays. Memorable wines along the way or any particular Grange vintages ? I have had the pleasure of often trying all the earlier Granges. The ones that stick in my mind were the 1953, 55, 62, 66 and 67 and the 1953 Grange Cabernet. All the ‘Block 42′ special bin Cabernets from the 53 onwards are real favorirtes. From the 1970s, the 1970 and 71 Granges stand out as well as the 1976. Many others in the 1980s and 90s and 2000s stand out as well. The 1962 Penfolds Bin 60A was tops as well. I have had many memorable fortifieds over the years, especially from the Lindemans and the Seppelts companies, the Rutherglen region and Penfolds of course. I must not forget the Penfolds St Henri wines, my favourites being the 1959, 62 and 66. 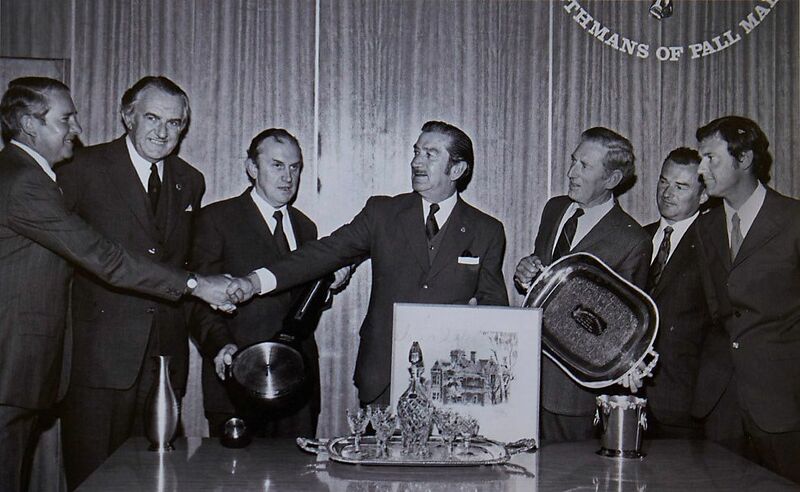 Adelaide Wine Show Trophy Wine Presentation 1973. L- R Don Ditter, John Nelson, John Davoren, Max Schubert, Ray Beckwith, Kevin Schroeter and John Bird : Photo supplied by Penfolds. Who has influenced you along the way ? I have to be careful here, or I’ll miss someone out. Max of course, Ray Beckwith, John Davoren, Murray Marchant, Don Ditter, Karl Lambert and Gordon Colquist. John Davoren and especially Murray Marchant taught me a lot. Murray was my immediate boss at Magill, he taught me about the chemistry of making up the solutions and understanding them. Murray and Karl also taught me how to analyse the wines. 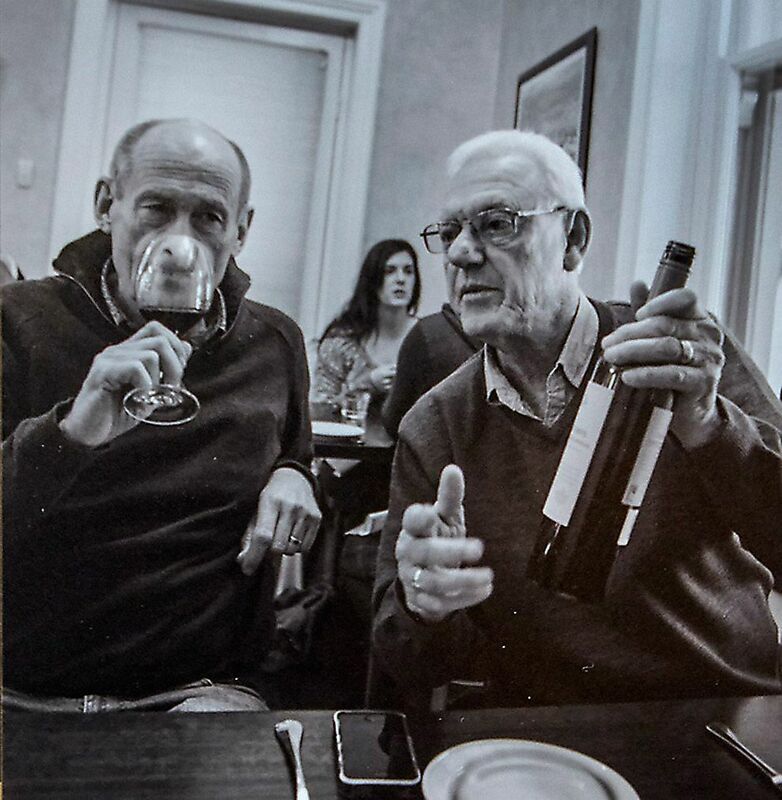 Don was a great educator to all winemaking and bottling staff. Gordon was my right hand winemaker at Magill and contributed greatly. I thought I knew how to blend but Max was the master. Max could not have done what he did without Ray. They were a great partnership. Ray’s discoveries, like how to manage pH, setting out system records and winery engineering complemented Max’s winemaking and blending skills. Ray was a top winemaker in his own right and a real gentleman . Even on his 100th birthday he was determined to stand up and speak, but really struggled to get to his feet. Once he did he was off, even at 100 years old he talked for over half an hour never missing a beat. Peter Gago, Steve Lienert, Jamie Sach and I made sure he had a steady supply of good Penfolds reds in Ray’s last days at a Barossa nursing home. We did not want him having the cask wine they normally served! Besides wine, I love history, antiques, sport and obviously my wife and family. I now have five grandchildren. I have a real soft spot for my two young granddaughters, they have me and their fathers right where they want us. Soup and sherry for starters, probably a Fino or an Amontillado. Then an entree of South Australian whiting paired with a Clare or Eden Valley riesling. For main, a small steak with a 1959 St Henri. I’d finish with a 1955 Grange and a small serve of Stilton cheese. Penfolds is a winemaking company and that’s what it is known worldwide for. I like to think I honour the tradition that’s come before and help keep it going. As a kid at times I used to stay at both my grandmothers’ places. I would pinch things from their laundries and start mixing the different liquids. I enjoyed it, different colours and different weight liquids. It’s amazing, that’s a long time ago and I ended up doing it all my life, just mixing and blending things. It’s very satisfying to take the raw grape material into the winery and make and blend it into something as complex as wine. It’s incredible what you can do. We used to spend many hours blending because the wines had to be perfectly balanced. We wouldn’t rest till we got it right, often well into the night. That’s the ‘Penfolds way’. I love being involved in the present. I’ve always felt great satisfaction working with younger winemakers, educating them in winemaking practices and Penfolds’ proud tradition and heritage. I have always tried to honour that tradition and maintain the family link. I’m the last of the true ‘Schubert and Penfold-Hyland’ winemakers still active. Overall I have worked with many good and capable people. They include of course winemakers, lab technicians, cellar staff, viticulturists, engineers, bottling and warehousing staff, coopers, admin staff, sales and marketing, general maintenance tradespeople, and so the list can go on. They all in their own way have given me great support in whatever was required at the time. 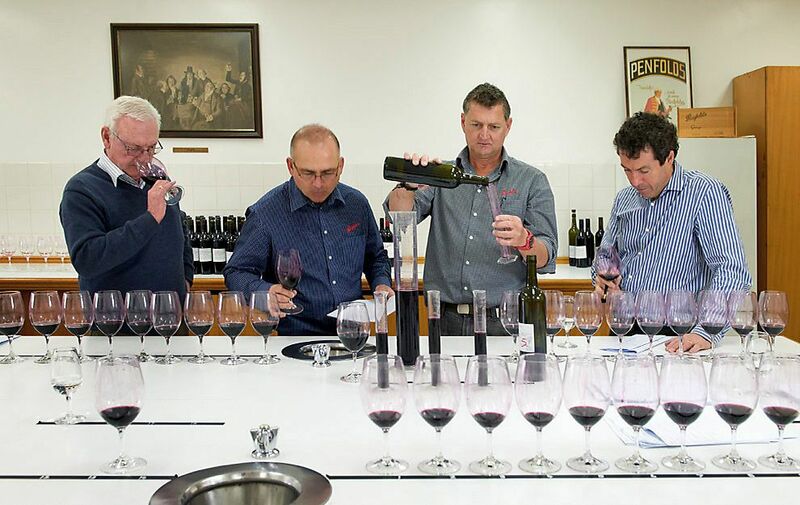 I am probably the only person to have worked for and with the four Penfolds’ chief winemakers, Max Schubert, Don Ditter, John Duval, and Peter Gago. In addition I had the pleasure of working with Ray Beckworth, John Davoren, Chris Hancock, Mike Press, Warren Ward and Peter Taylor – any of whom could easily have been chief winemaker if the course of history had been slightly different. All of those people contributed to my success, satisfaction and enjoyment. I thank them all for putting up with me through thick and thin. Lastly I would like to thank the Penfolds company from the Penfold-Hyland family days right through to now, for letting me have a very satisfying and rewarding job over all these years.